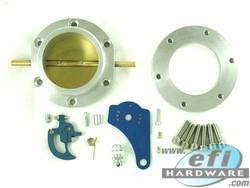 Great throttle bodies for making virtually any individual throttle body (itb) setup. Throttle blocks are machined from billet aluminium & are only 20mm thick for 40mm to 50mm bores and 25mm thick for 52 to 55mm bores, ideal for application where space is tight. These have lip seals behind the bearings and orings on front and back faces. Available in 40, 45, 48, 50, 52 and 55mm pairs at various centres. Seals are installed behind the bearings. 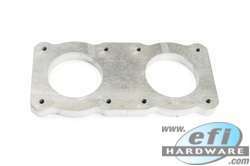 Designed specifically for the the GReddy manifold for RB25DET engines. This is a direct bolt on. 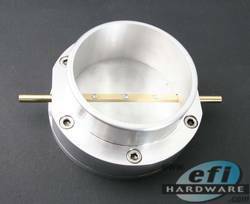 A cable pull and cable mounting bracket are also supplied. 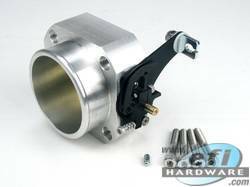 An O ring is supplied and installed between the throttle body and mounting flange and seals are fitted behind the shaft bearings.